Industry demand is driven by food consumption which depends on population growth and economic conditions. Additionally, food safety, production flexibility, and efficient operations also contribute to success. We produce high performance, energy efficient motors, controls, and gearing that maximize equipment performance and operating profits by reducing energy cost. We are an industry leader in providing stainless steel, composite, and epoxy coated power transmission systems, motors, and control products along with production line components that meet global standards for food safety. A frozen vegetable processor was experiencing downtime at the worst time of the year – harvest! The peas, carrots, and corn could not be processed due to mounted bearing failures. This resulted in costly and unplanned downtime as well as the added potential for contamination. Motors help baking machinery increase operator safety - installation of motors with integrated emergency stop features is a game changer. LEESON® is a pioneer in energy efficiency electric motors spanning more than 6,000 stock AC and DC motors, gearmotors and variable-speed control solutions. All are built for rugged commercial and industrial applications. All-Important Peanut Industry Depends on Precision Equipment - Peanut dryers critical to ensuring successful harvest, but not all created equal. LEESON® is a pioneer in energy efficiency electric motors spanning more than 6,000 stock AC and DC motors, gearmotors and variable-speed control solutions. All are built for rugged commercial and industrial applications. Washdown motors improve food processing plants’ productivity - Smithfield Foods installs new motors and dramatically reduces maintenance, downtime and expenses. 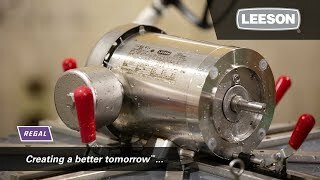 LEESON® is a pioneer in energy efficiency electric motors spanning more than 6,000 stock AC and DC motors, gearmotors and variable-speed control solutions, built for rugged commercial and industrial applications. Quickly replace the bearings on the Extreme Duck Ultra motor by following these simple disassembly/reassembly instructions. 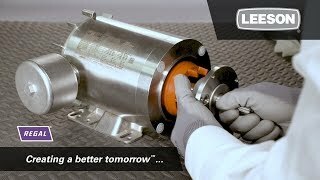 The LEESON® Extreme Duck® Ultra IP69 certified washdown motor designed to withstand high temperature, high pressure, and close proximity of water and mixture of chemicals used during the cleaning process. 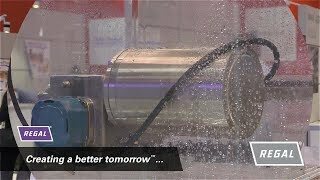 Regal® products resolve washdown application challenges with LEESON® and Marathon® motors, Grove Gear® or Hub City™ gearboxes, Sealmaster® bearings and System Plast® NG® EVO conveyor chain. 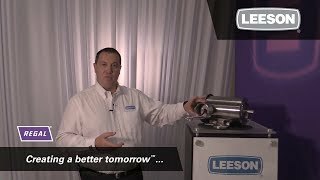 The Extreme Duck® Ultra motor by LEESON® is our stainless-steel encapsulated motor. Our patented solutions ensure greater reliability and uptime by providing maximum protection in the most demanding washdown environments. 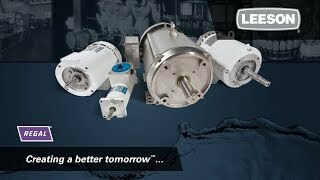 The LEESON® Washguard® industrial-duty line of motors are designed to meet the demanding conditions that you may find in processing plants, chemical processing, pharmaceutical plants and beverage and brewing industries. System Plast® New Generation® chain and modular belt components use proprietary engineered resins designed to provide our customers with a sustainable advantage over “industry standard materials”. 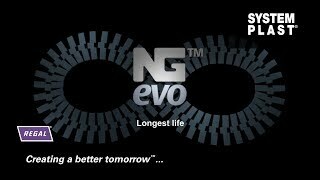 Visit us here. 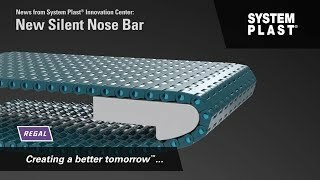 System Plast® low noise nose bars were designed with a special shape that strongly reduces the noise produced by traditional designs and helps lower energy consumption. 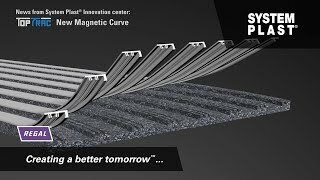 The System Plast® TopTrac™ system is a new concept for magnetic curves offering Nolu® SR wear strips and a new magnet design with optimized magnetic fields. Regal manufactures high quality motors, controls, and power transmission products for a myriad of industries and applications. Our motors range from high efficiency severe duty motors to variable speed and wash-down duty motors. Additionally, our drives and controls are “Performance Matched” to operate seamlessly with our motors. The reliability of our power transmission products guarantees years of trouble-free performance in the most demanding applications. Machinery demand from food processors has remained relatively resilient due to the introduction of a growing product range, namely healthy products packaged for convenience. Low-fat baked chips and low-calorie, small-portion snack packs have successfully catered to health-conscious consumers, while adhering to widespread demand for affordability. These trends have supported demand for food-processing machinery. Improved economic conditions are expected to continue to drive growing downstream demand for food machinery, as manufacturers experience the benefits of increased consumer spending. Strengthening consumer demand will flow up the supply chain, lifting industrial production; in turn, demand for manufacturing machinery will increase. Additionally, new technology and food safety concerns will continue to benefit the food processing segment. In particular, demand for easy-to-clean equipment will rise in light of greater public and government scrutiny surrounding food safety and hygiene. Finally, demand for food processing equipment will rise as innovation continues and new products adapt to address these concerns. Growth is projected through 2021. Regal actively supports and participates in industry leading trade associations, such as the United States Department of Agriculture and the Bakery Institutes Sanitation Standards Committee (BISSC), that promote the food industry and its member organizations.